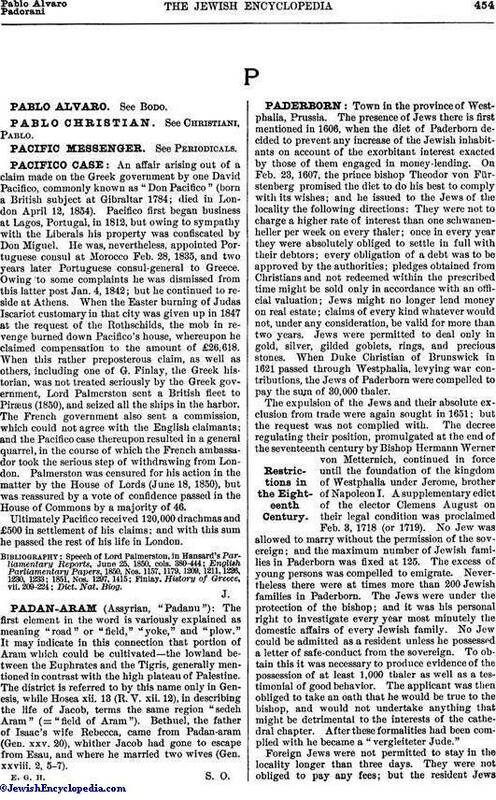 An affair arising out of a claim made on the Greek government by one David Pacifico, commonly known as "Don Pacifico" (born a British subject at Gibraltar 1784; died in London April 12, 1854). Pacifico first began business at Lagos, Portugal, in 1812, but owing to sympathy with the Liberals his property was confiscated by Don Miguel. He was, nevertheless, appointed Portuguese consul at Morocco Feb. 28, 1835, and two years later Portuguese consul-general to Greece. Owing to some complaints he was dismissed from this latter post Jan. 4, 1842; but he continued to reside at Athens. When the Easter burning of Judas Iscariot customary in that city was given up in 1847 at the request of the Rothschilds, the mob in revenge burned down Pacifico's house, whereupon he claimed compensation to the amount of £26,618. When this rather preposterous claim, as well as others, including one of G. Finlay, the Greek historian, was not treated seriously by the Greek government, Lord Palmerston sent a British fleet to Piræus (1850), and seized all the ships in the harbor. The French government also sent a commission, which could not agree with the English claimants; and the Pacifico case thereupon resulted in a general quarrel, in the course of which the French ambassador took the serious step of withdrawing from London. Palmerston was censured for his action in the matter by the House of Lords (June 18, 1850), but was reassured by a vote of confidence passed in the House of Commons by a majority of 46. Ultimately Pacifico received 120,000 drachmas and £500 in settlement of his claims; and with this sum he passed the rest of his life in London.